Is this high-res hybrid more than just an SLR-a-like? Samsung's been trying to break into the lucrative keen-amateur camera market for some years now, and the Samsung NX10 is its best effort to date. Previous Samsung bridge cameras and GX-series SLRs were bulky and expensive affairs; while not bad cameras in their own right, they simply couldn't ace similar models from the big Japanese makers. Despite Samsung's best efforts in a highly competitive market, it's not sold as many D-SLRs as compacts (it's been selling a million compacts a year). With the advent of the advent of Micro Four Thirds-based hybrid cameras, Samsung's seen a fresh opportunity to take some market share from Canon, Nikon and the rest. But we need to remind readers from the outset that the Samsung NX10 is not based on Micro Four Thirds technology. Samsung's boffins have come up with their own solution, but the outcome is basically the same; namely a mirrorless, interchangeable lens camera with Electronic Viewfinder. The nature of hybrid camera technology levels the playing field somewhat between DSLR makers, who can draw on a strong optical and 35mm camera heritage, and consumer electronics specialists, such as Samsung and Sony. Suddenly it's less about esoteric mirror arrangements and reflex viewinders and more about circuit-board wizardry. Another selling point of the Samsung NX10 is the inclusion of a three-inch OLED screen. As you'd expect from a big player in TVs, Samsung claims this offers a wide range of viewing angles and better contrast than more conventional rear screens. The Samsung NX10's resolution is right up there too. While some Micro Four Thirds hybrid have felt a bit compromised when it comes to sensors, the Samsung NX10 packs a 14.6 megapixel, APS-C sized chip. The size is significant, as sensor-wise at least, it puts the Samsung NX10 on the same level as a consumer DSLR. 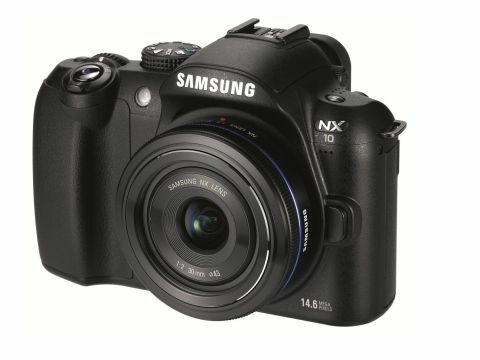 Currently selling for around 500 quid, the Samsung NX10 is very keenly priced. It takes the fight to the similarly priced Panasonic GF1 and Olympus Pen family, and also competes against entry level D-SLRs, such as Canon's EOS 500D. So plucky Korean contender Samsung has certainly got a fight on its hands.